Prince Edward County (PEC), a single-tier municipality in south-eastern Ontario, is a rural agricultural county rich in cultural and natural heritage. Recently, the County has undergone a major shift from traditional ‘milk and meat’ agriculture toward new forms of agriculture reflective of the emerging creative economy. Culinary and rural tourism, winemaking, artisanal industries, organic, specialty and small farms, as well as other on-farm innovations are now redefining the economy of the region. In response to these shifting trends, Prince Edward County’s Economic Development and Planning Departments have adopted a Creative Rural Economy strategy designed to maximize the County’s economic, environmental, social and creative capital. The Official Plan of Prince Edward County has not kept pace with the changes underway in the County and is currently under review. 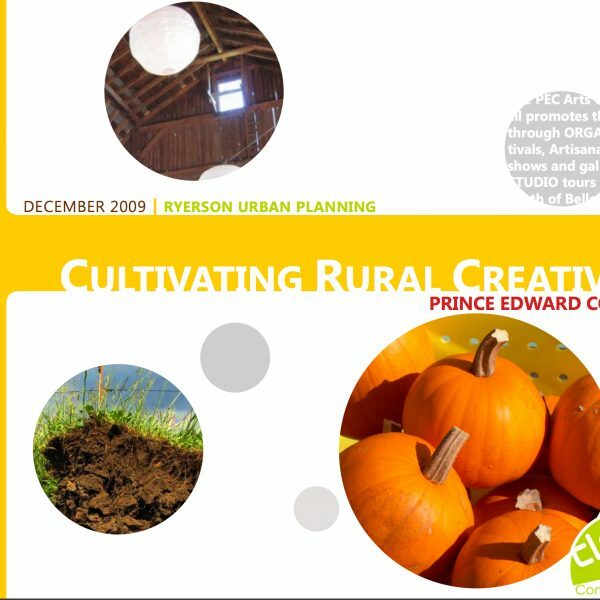 Cultivating Rural Creativity provides recommendations leading to a more favourable environment for creative industries in the county, while retaining the unique rural character that define Prince Edward County. The students identified five guiding principles that are interdependent, nested, and founded upon the protection of Prime Agricultural Land. These are: to retain Prime Agricultural Land, to intensify urban areas, to promote rural innovation, to explore and institute progressive zoning options, and to encourage public engagement. The students expanded upon these guiding principles as the foundation for shaping Prince Edward County’s new Official Plan. Additionally, the students drafted a series of Official Plan changes in four categories: agriculture, urban, rural, and industrial. This project provides a good starting point for further action towards harmonizing the County’s Official Plan with its Creative Rural Economic Strategy.